I am 3 years from 35. When I reread that last sentence, I feel defeated. Tired. Weighed down. There is the possibility of this taking 3 more years. Odessa will be 6 when she meets her extended family members, spends the night at her grandparent's house and plays with my friends kids. However, over a month ago the Haitian adoption office accepted my paperwork. I had been waiting 20 months for that. SO that is a HUGE step in the right direction but not the last. I have met others here in Haiti who have adopted or are in the process also. I have helped some of them out and they have certainly helped me. My problem is not everyone is doing it the RIGHT way. Haiti is a country where bribes and pay-offs are part of daily life. But does that make it alright for us Christians to go around the law? I was told a few weeks ago by someone that they have a contact that can get my paperwork processed even though I don't meet the age for $1000 US. At first I was estatic. My heart was racing and plans of buying 2 plane tickets to Columbus, Ohio started being set in my mind. The person explained how this is a "under the table" payment. And they could give me references of people who did it and it worked. Talk about someone setting a big shiny apple of temptation right in front of my eyes. In that moment I understood Eve. I was being told no one would know of this "deal". The person even went as far to tell me that is everyone else is jumping on one foot to get something, sometimes you have to jump on one foot too. The reason I am writing about this a month after I learned about it is...I almost bit the apple. This apple is the one thing that has been on my mind and heart for nearly 2 years. I justified in my mind saying that this could be help sent by God. Yea...that's it...His way of helping me finish Odessa's adoption. I told myself that the law here is stupid and I have taken care of Odessa for almost 2 years so I have proven I can do it. But there was always that gut feeling that it wasn't right. I tried to shut it up. Ignore it. Justify. But nothing worked. "Everybody else is doing it." OK not everybody. But a significant number. People not doing adoptions the right way. They say one false document isn't a big deal. Or that it is too difficult to find a certain person for legal signatures. Or that paying government officials for signatures is just part of the game. 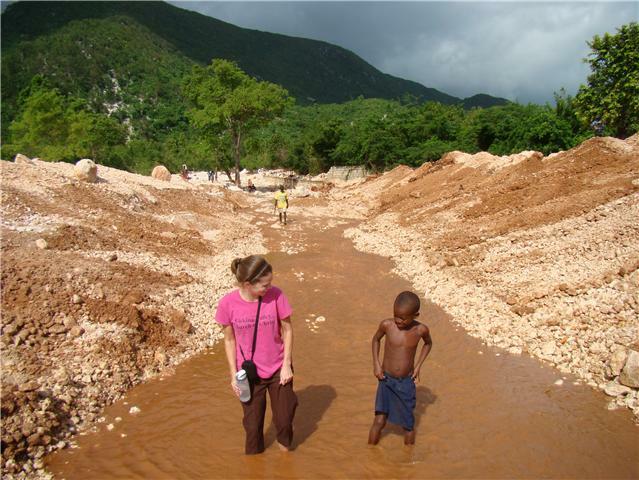 Adoption in Haiti is hard. I think the government makes it that way on purpose. I also think it shows who is willing to go the extra mile because it is the right thing to do for the child they say they love. "Anyone who knows the right thing to do, but does not do it, is sinning." I know what the right thing is to do. It stings so much though when I see others farther ahead in their adoption process than I am b/c of this. And these people beautifully justify why they are doing it. But my little girl is worth every day of waiting. And I know God cares about the way His people interact with the world. don't ever say things that are not true. keep away from evil paths." This coming week I am going to read these verses everyday. Remembering what God wants of me. Not to look at what others are doing but looking straight ahead at what is good. And praying I focus on what is RIGHT...not the shiny red apple being dangled in front of me. Disclaimer: This post is not meant to give the impression I am perfect. those of you who know me this is FAAAAR from the truth. But I am trying to follow God's word and wanted to share one example of a struggle I hope to win with you. Thank you, yet again, for reminding me that we as Christ followers need to live to His expectations not the world's!!! Thank you for your honesty and transparency. Give Odessa hugs and kisses, and tell her she has one great mom. So glad to hear you are allowing God's way to work...it's not always easy, but it is the best way! Hang in there....I have learned if I go God's way and allow him to work, when the trial is over..I have to stand back in amazment at how much better he worked the situation out then what I would have done. God cares! Take care.